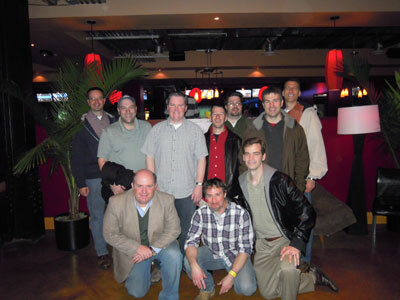 With two weeks to go before my wedding, I was treated to an wonderful bachelor party in Philadelphia! My best man, Paul, put together a great agenda for our group of 10, which also included my local friends Jeff, Todd, and John; former coworker, Rob; and college buddies Tony, Larry, Brian, and Marc, all of whom graciously drove a few hours to Philly to join in the celebration. Paul picked me up at my house on our way into Center City, where we checked into the Doubletree Hotel on Broad Street. We were greeted by my out-of-town friends near the bar in the lobby, and they joined us in our hotel room for some beers and snacks. We walked a few blocks to The Capital Grille, where we joined the rest of the group for our 5 p.m. dinner reservation. We started with two large shellfish platters of lobster, shrimp, and oysters for an appetizer, followed by some enormous, delicious steaks. The food and service were equally impeccable, and I can’t wait to go back for another special occasion. Most of the group rounded out the night with a few rounds of beer (and a shot or two, naturally) at my favorite bar in the city, McGillin’s Olde Ale House. After such an action-packed evening, Paul and I both managed to avoid a full-blown hangover, but still felt rather groggy the next morning. (We learned that some of our cohorts weren’t quite as fortunate overnight.) For the subset of the group who had stayed at the Doubletree, we met up for a Sunday brunch buffet at Balcony, the restaurant on the hotel mazzanine, before checking out and parting ways. Paul drove me back to my house by mid-afternoon and gave me a few of his leftover “hangover kits,” complete with bottled water, aspirin, and salty snacks — a simply brilliant idea. Many thanks to everyone, especially Paul, for organizing such a great night out on the town! In the spirit of spring cleaning, I’ve finally made some long overdue changes to this site. I’ve removed some older and rarely updated sections, including links to other blogs, a list of my favorite albums, and a page dedicated to Penn State football. The previous teal color scheme in the headers and navigation is now a more neutral light gray. I’ve also simplified the layout of the archives index, and updated the previous “Credits” page as a more concise page called “Colophon.” Among the navigation graphics, I’ve increased the text spacing for better legibility, and added some external links for good measure. I’m hoping to implement a more large-scale overhaul later this year. At a minimum, I need to update the current table-based layout (which has its origins in a redesign from December 2003, believe it or not!) to allow for easier maintenance. But I’m also still thinking about moving this site to a blogging platform (perhaps WordPress or Squarespace) along with a cleaner design. I was grateful that our loved ones were excited for us and wanted to hear about our plans, but to me, that question was absurd. With so many options to pick from — and having not cheated by looking at venues before getting engaged, like many overeager young couples these days — how could we possibly coordinate a date for a church and reception venue that fast? Well, let’s see. We’re still working on a few remaining items with the local print shop (menus, place cards, table numbers, and thank-you cards), and I will design and print the wedding ceremony programs at home. Joan and I are looking forward to a lunch with my parents this week at Trattoria Giuseppe, the venue for our rehearsal dinner, where we’ll finalize the menu selections. And we still need to finalize our playlist for the band, buy some gifts for our parents, nail down some details for the honeymoon, and of course, figure out the seating arrangement for approximately 200 guests.